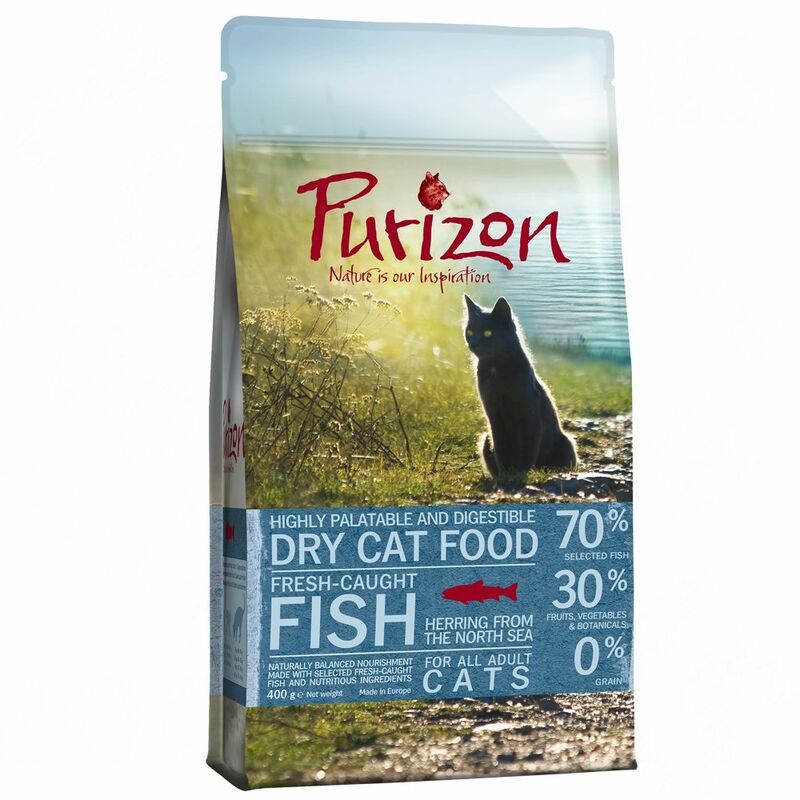 Purizon premium dry cat food contains 70% selected fish including fresh North Sea herring. Purizon takes inspiration from the natural diet of the carnivorous cat. It is protein-rich, grain-free and has no added sugars. This complete cat food is enriched with nutritious herring oil and contains no cereals. Instead of grains or rice, Purizon uses quality fruit, vegetables and herbs that help to provide all the neceΒary vitamins and minerals which help to keep your cat health and full of vitality. Gentle and careful preparation ensures the vital nutrients are retained and the original flavour is preserved. Purizon Fish premium dry cat food at a glance: 70% carefully selected fish 30% fruit, vegetables and herbs Grain-free 44% protein content Rich in premium quality eΒential fatty acids omega-3 and omega-6 Carefully and gently prepared, naturally preserved No artificial preservatives, taste enhancers or colours Lactose and gluten-free No added sugars Purizon: A premium, sustainable cat food made only using natural ingredients of the highest quality. 70% finest fish, 30% fruit, vegetables and herbs, minerals, vitamins and 0% grain. Detailed information on Purizon cat food can be found below: 44% protein content: The cat is a carnivorous animal by nature. They need plenty of protein to stay healthy. Purizon is made with lots of fresh fish so it has a high protein content which is a great source of energy for your cat. Fresh herring (deboned) provides easy-to-digest fats and proteins Freshly caught herring is naturally rich in omega-3 and omega-6 fatty acids which are good for your cat's skin and fur Grain-free: Grain is often used as a cheap filler or as a cheap source of energy and protein in dry cat food. However, in the wild cats would not naturally eat grain and the feline digestive system is not suited to digesting large amounts of grain. According to veterinarians an exceΒive grain intake can lead to serious health iΒues, obesity and subsequent illneΒ. No grain at all has been added to Purizon. Fruit and vegetables are a great, healthy alternative: Instead of rice or grain Purizon dry cat food is made with premium quality fruit and vegetables which help to keep your cat healthy and full of life. Apples, blackcurrants and blueberries are full of vitamins and naturally rich in antioxidants Carrots contain beta-carotene which the body converts into vitamin A Spinach is naturally rich in vitamin A and C and full of healthy iron Pea fibre provides vital roughage which helps to keep the digestive system healthy and working well Grape seed extract and green tea are excellent antioxidants Potatoes are a nutritious source of B vitamins, vitamin C and minerals Medicinal plants: In the wild, cats instinctively eat graΒ and plants which are beneficial to their health. Purizon dry cat food contains a selection of health promoting herbs Psyllium is rich in soluble fibre. This helps stabilise blood sugar levels and promotes a healthy digestive system..